Todd Wong, with Terry Glavin, and Terry's wife Yvette – BC Book Prizes. 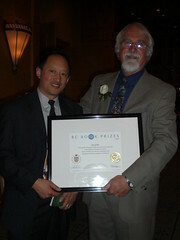 I was at the BC Book Prizes last night and my friend Terry Glavin received the Lt. Gov. Award for Literary Achievement. It was a fun evening, and I sat with the Editors Association of Canada, the table organized by my friend Ann-Marie Metten. Lt. Gov. Stephen Point always makes a great speech, not only about his personal contradictory job of being a First Nations Catholic representing the Queen, head of the Anglican Church, for which he had spent a large part of his life in defiance to for pushing First Nations rights, but also about the ability of BC authors, publishers and citizens for overcoming challenges for racial, historical and cultural differences. I first met his honour, last year, when the BC Community Achievement Awards were presented at his Victoria home of Government House. He really likes the concept of “Gung Haggis Fat Choy” and he shared with me that he does have some Scottish ancestry from a forefather named Jamieson. Commander. King Wan is one of the six rotating honour guards that accompany the Lt. Gov. when he attends events in the Vancouver area. Cdr. 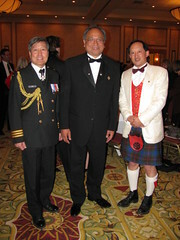 Wan is the first Asian-Canadian high ranking officer at HMCS Discovery in Stanley Park. We know each other from the many events of Pacific Unit 280 for the Chinese Canadian veterans. Our friend Daphne Marlatt won the Dorothy Livesay Poetry Prize. 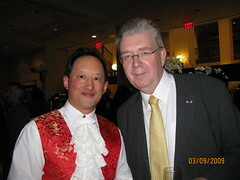 I met Steven Hume, author of Simon Fraser: the Search for Modern British Columbia. We had a great time talking about Simon Fraser history – especially how Fraser was actually born in the United States just outside Vermont, in disputed New Hampshire territory, and how Fraser himself, had never ever set foot in Scotland. 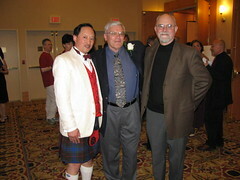 The kilt I am wearing is the modern hunting Fraser tartan, which Steven thought looked amazing similar to a Hume tartan. I recounted the story of how the origins of “Gung Haggis Fat Choy” go back to my days as a tour guide at Simon Fraser University telling stories of Simon Fraser University in the mid-1990's. Standing with is is Howard White, publisher of Harbour Publishing. Hume's “Simon Fraser' is the one book that I purchased at the end of the evening, published by Harbour Publishing. Michael Nicoll Yahgulanaas (aka “Haida Manga Guy”) was nominated for the BC Bookseller's Choice Award, for his book Flight of the Hummingbird: A Parable for the Environment. Sheryl Mackay presented the first award of the event for the Ethel Wilson Fiction Prize, then recorded the rest of the evening for her CBC Radio early morning radio show North By Northwest, and had everything edited for the delight of listeners less than 10 hours later… WOW! Hopefully she was still perky and beatific! Here are my pictures on Flickr. literary excellence in the province. Governor’s prize which awards $5,000. congratulates all of the winners! 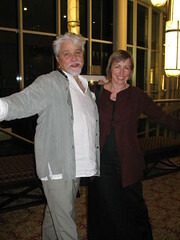 This entry was posted in Literary Events, Main Page on April 26, 2009 by Todd. This entry was posted in Main Page on April 26, 2009 by Todd. Week's Main Street Literary Tour. I don't have a copy of the cover yet, but will supply it as soon as I can. Have fun, everyone! Hope to see you there. This entry was posted in Main Page on April 24, 2009 by Todd. Book and Magazine Week. Daphne read first, then George, followed by Nilofar. After a brief intermission that allowed people to purchase books and have them signed by the guest poets, the talk turned to Save the Al Purdy A-Frame. 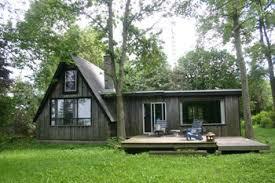 Shelagh Rogers shared her story of doing the last public interview with Al Purdy at the Eden Mills Writers Festival. Jean Baird is heading up the Save the Purdy A-Frame campaign, and she and her husband George Bowering shared their many stories about Al Purdy and his wife Eurithe. This entry was posted in Main Page on April 23, 2009 by Todd. We since became friends and look for reasons to go for a pint of Guinness at the Irish Times Pub in Victoria, or host a Gung Haggis house party at his place… but the only thing we manage to do is leave comments and links to each other blogs. Terry has written amazing books, and is very big on diversity – both cultural and environmental and bio-diversity. Moreover, I think we recognize in each other a deep respect for First Nations culture and history, the ability to laugh and poke fun at mainstream institutions, and the necessity of shaking up the world a little now and then. At last year's BC Book Prizes, I got to hang out a bit with Gary Geddes, the 2008 winner of the Lt. Gov's Award for Literary Excellence. Vancouver on April 25, 2009.
natural history and our future as a just and sustainable society. the dialogue that sustains a civil society. have been lost to us. Kay , host of CBC’s North by Northwest. $5,000 and a commemorative certificate. 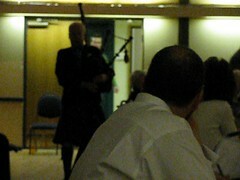 This entry was posted in Commentaries, Cultural Fusion, Library Strike, Literary Events, Main Page, Scottish, Gaelic, Irish Celtic events and stories, Upcoming Events on April 21, 2009 by Todd. This is going to be an exciting event, created for BC Book and Magazine Week. 4 poets in an intimate setting with special host Shelagh Rogers. Innaugural Kogawa House writerinresidence John Asfour has invited 3 nominated poets for the BC Book Prizes Dorothy Livesay Poetry Award: George Stanley, Nilofar Shimehr and Daphne Marlatt. 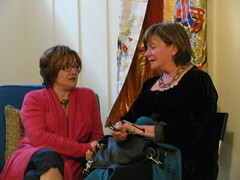 Shelagh Rogers did the last public interview Purdy at the Eden Mills Writers' Festival. Shelagh says “He was awesome,” and will share her Al Purdy memories with the audience. April 21 is National Al Purdy Day. as part of BC Book and Magazine Week. and Art and the Vancouver Public Library. title Joy Is Not My Profession (Véhicule Press), and he selected, edited and introduced the landmark anthology When the Words Burn: An Anthology of Modern Arabic Poetry, 1945–1987 (Cormorant Books). Prize Society. George Stanley (Vancouver: A Poem), Nilofar Shidmehr (Shirin and Salt Man) and Daphne Marlatt (The Given) are finalists for the Dorothy Livesay Poetry Prize. located at 1450 West 64th Avenue, Vancouver. Entrance by donation. 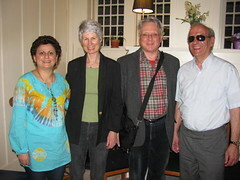 This entry was posted in Joy Kogawa & Kogawa House, Literary Events, Main Page, Upcoming Events on April 18, 2009 by Todd. Admission by donation. Space is limited. and former publisher of www.rabble.ca. Come join us on Friday, April 17, as Judy Rebick speaks about her new book Transforming Power. This entry was posted in Joy Kogawa & Kogawa House, Literary Events, Main Page, Upcoming Events on April 17, 2009 by Todd. It's been too rainy and cloudy for me to go skiing at Silver Star this weekend. So I kayaked on Kalamalka Lake and helped walk the doggies up in Kalamalka Lake Park, where the snow still lies. Yesterday I went to Village Green Mall in Vernon, where people were buying Chocolates and in the food court, an Easter show for families consisted of trying to fit 12 members of the Vernon Girls Trumpet Band into a giant balloon. (photos to follow). After a week of Tartan Day/Scottish Week activities… and not having any Chinese food in recent memory… I am beginning to question my Easter heritage. Even though my great-great-grandfather was a Chinese United Church Minister, I never went to United Church for Easter. For many years, I was a member of Celebration of Life Centre, and Centre for Spiritual Living – both New Thought Churches. The only Chinese cultural event that I can think of, is giving Red Eggs at a dinner, one month after a baby is born. But this isn't necessarily related to Easter, except perhaps as a reminder of sucessful fertility in relation to Spring fertility rituals. I remember one childhood Easter where we received Easter baskets in Honolulu. There were always lots of Chocolate bunnies for Easter as a child, but the Honolulu baskets had the little fluffy toy chick decorations… That was cool. No grass skirts on Easter bunnies back in the 60's though. The Gung Haggis dragon boat team paddled this morning to Granville Island for Hot Chocolate and Coffee, and found some Easter Eggs. This is becoming a team tradition. Gung Hay Beannachtaí na Cásca Fat Choy, comrade. This entry was posted in Canadian Identity, Canadian Identity & Heritage, Commentaries, Cultural Fusion, Main Page, Multicultural events, Scottish, Gaelic, Irish Celtic events and stories on April 13, 2009 by Todd. 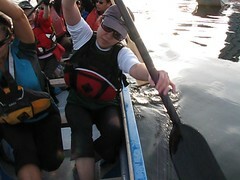 join Gayle Gordon's G-Force Wind at 9:45am/10am to 11:30 on the water. what it is… seeing a dragon boat team practice from a drummer/coach's position at the front of the boat. 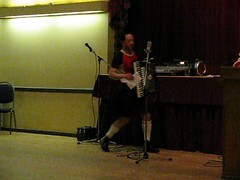 Wendy's 4th year with Gung Haggis, after joining as a rookie in 2006. Hillary (behind Gayle) make as they pull together with each reach. season with us, and Keng's 5th season after joining us after Alcan Festival in 2005.
the 3rd row, Christine is on the left and Ashleigh on the right. 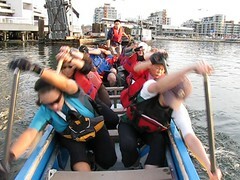 This entry was posted in Dragon Boat Information, Dragon Boat photos 2003, Dragon boat with Todd Wong - Dragon Boat Coach, Gung Haggis dragon boat team information, Main Page on April 12, 2009 by Todd.